Home > OCT 2016 > Indian Share Market: Are shrinking FII inflows a cause for concern? Indian Share Market: Are shrinking FII inflows a cause for concern? 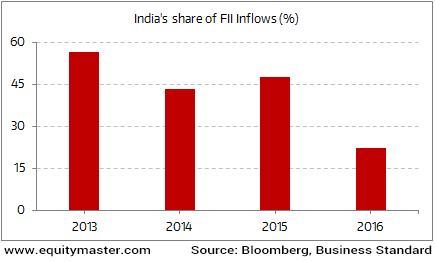 Are shrinking FII inflows a cause for concern? Indian equity markets have given good returns since the lows seen in August 2013. The index itself has returned over 45% on an absolute basis in the past few years. Domestic as well as foreign investments flows have been strong since then. However, India's share of FII flows among emerging markets like Brazil, South Korea, Taiwan etc. has seen a steady decline. The primary reason being foreign investors are apprehensive over stretched valuations in Indian markets compared to some emerging markets which are comparatively still trading cheap. The returns from the benchmark index BSE-Sensex has been lower than in the MSCI Emerging market Asia Index. Should the declining foreign inflows raise alarm bells to the general public? It is good to have diverse set of participants in the market. However, one must not think of these foreign inflows as similar to the proverbial 'smart money' reducing exposure to Indian equities. The proverbial smart money might just be wrong when it comes to India. With the present government pushing for reforms and working towards simplifying tax rates, improving the ease of doing business etc. such initiatives are akin to a strong foundation that would help bolster the Indian economy in the long run. These fundamental factors together will drive the markets forward in the long run and one would be wise to keep a track on these than divert attention to fund flows.